I decided to stay up all night long to watch the live streams so I'll update this post every couple of hours with what I spotted in the stream. 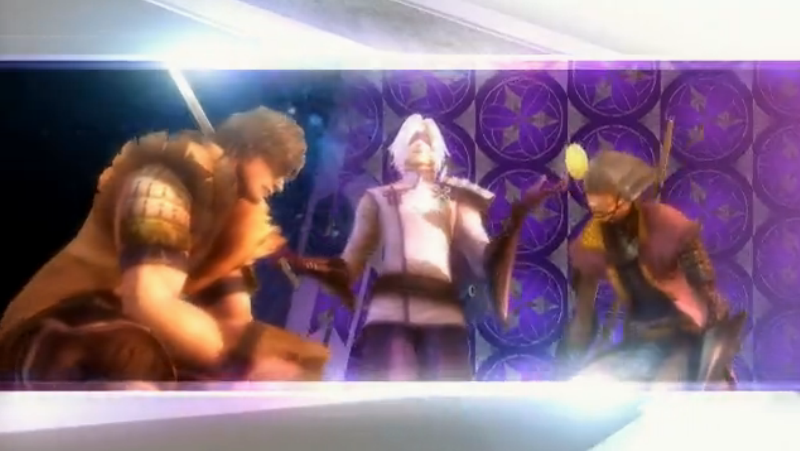 The Sengoku Basara 4 Sumeragi VS DMC4 SE was the first channel I checked out. After an introduction from hosts KobaP and net personality Gatchman, director YamamotoD joined them for the informal Sengoku Basara 4 Sumeragi 'super' latest information corner. They introduced the game to new viewers and ran through the latest announcements. 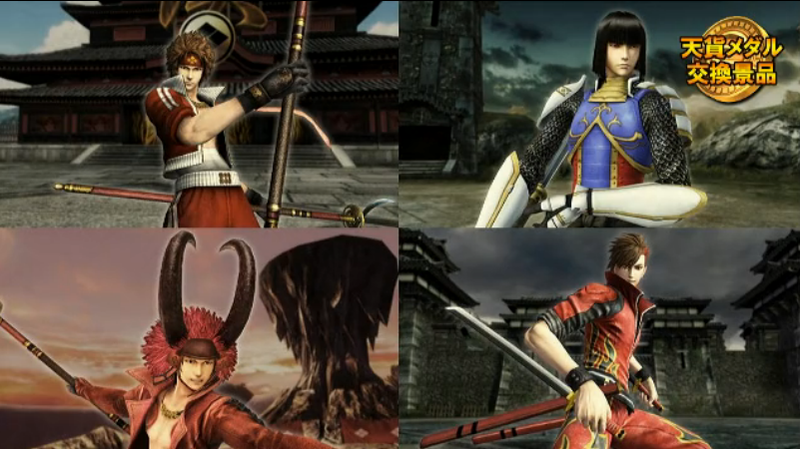 One of the first things they confirmed was that the five non-playable characters from Sengoku Basara 4 are now playable, as we knew. 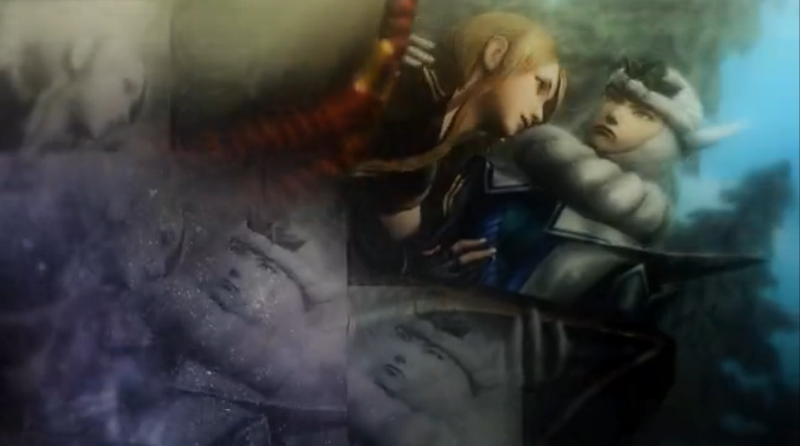 The background of the picture showed glimpses of the five characters' Giga Basara ink artwork. 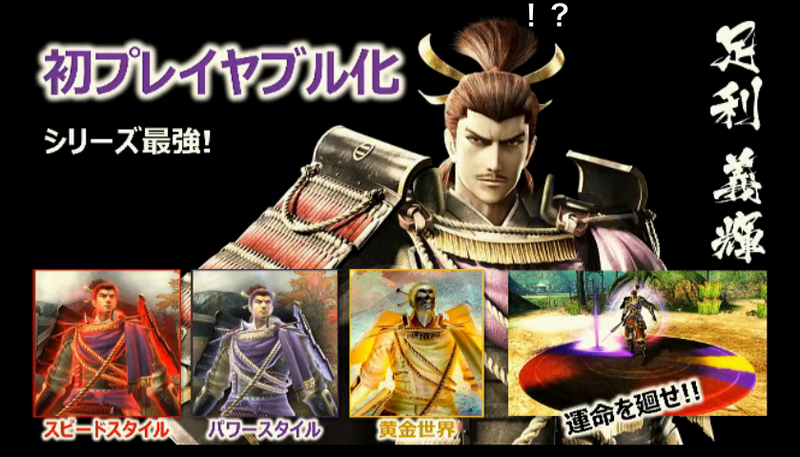 It looks as though Shingen, Kenshin, Kasuga, Toshiie and Matsu will have pictures of a tiger, Bishamonten, a flurry of roses, something I can't work out at all from the picture and a hawk respectively. 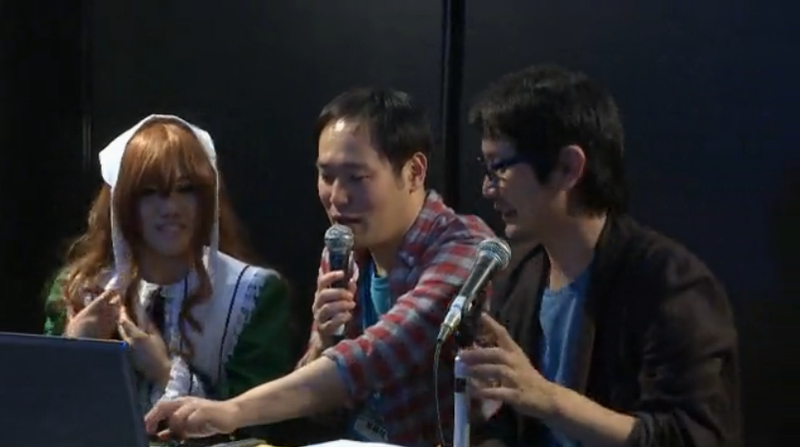 KobaP commented that there were a lot of Kasuga fans out there and they'd been very vocal about their disappointment when she wasn't playable before. They also highlighted the three brand new characters in more detail. Next came a rundown of the new game mechanics and some previews of more of those medal reward costumes. 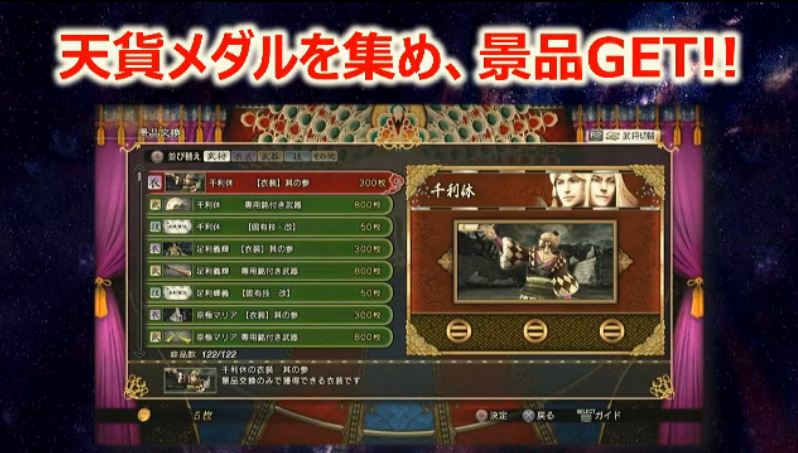 It's hard to make this picture out but it shows the new characters will have skill revisions for purchase too in case that wasn't obvious. Also, the costs are different to those in the previous screenshots we've seen which is annoying; I wonder which values are correct? 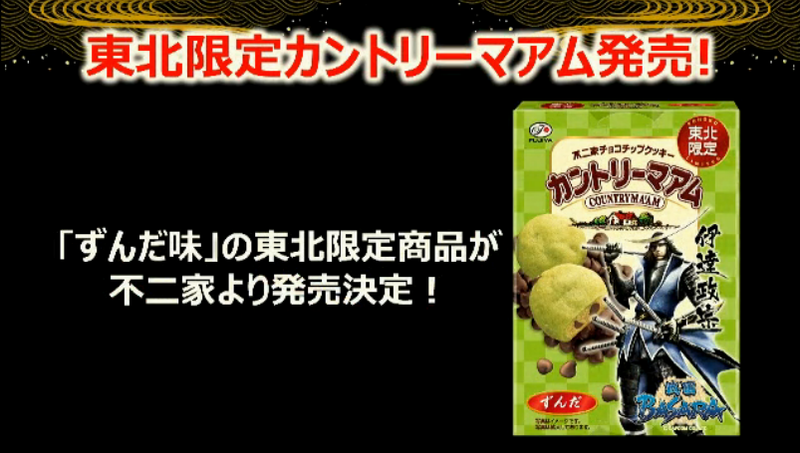 They described Rikyuu's medal reward third costume as the 'coffee version' (lol). 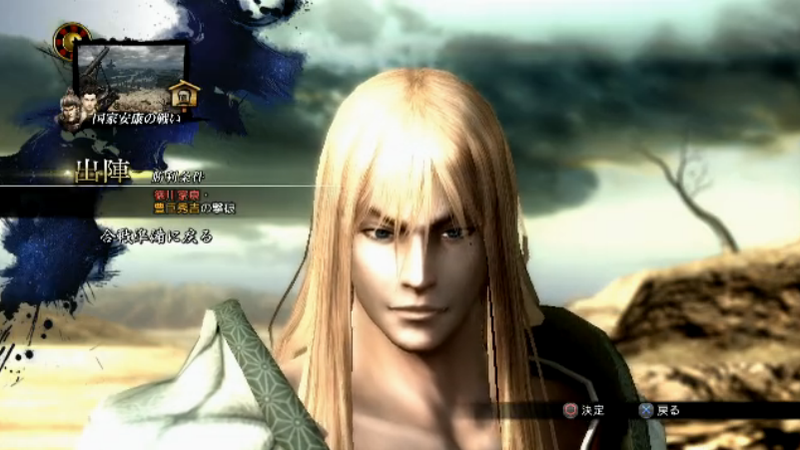 They also highlighted one of Masamune's costumes we already knew about. 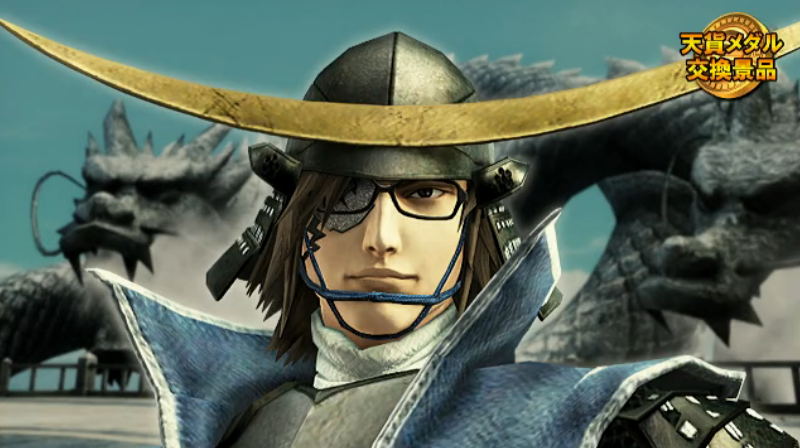 There's no reason for this costume other than the opportunity to make a joke about 'Date Masamune' and 'Date Megane' ('fake glasses'); it's silly fan service. 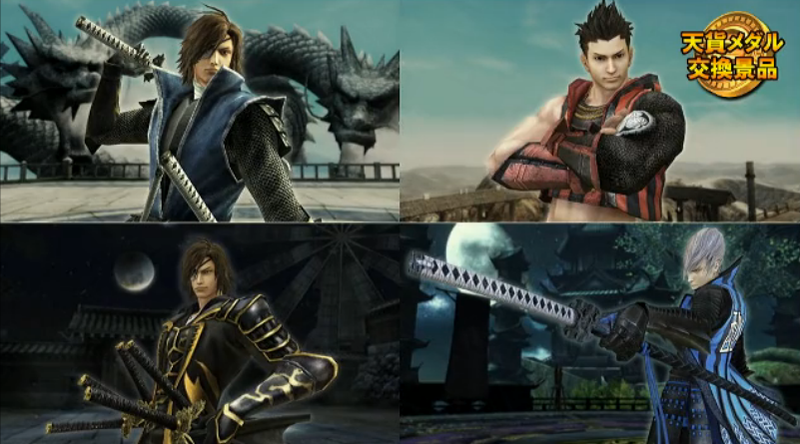 The Light Armour (no helmet) and Pitch Black Dragon King versions of Masamune were shown off for the first time, along with a new blue costume for Mitsunari. 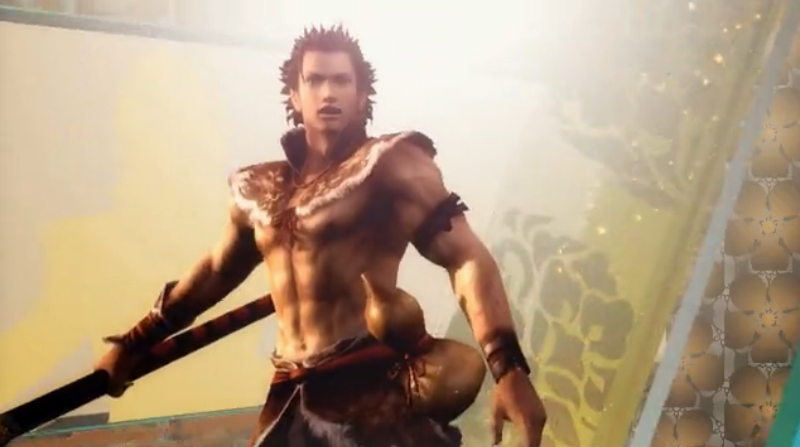 I'm only going to mention the new ones - sorry, Ieyasu! 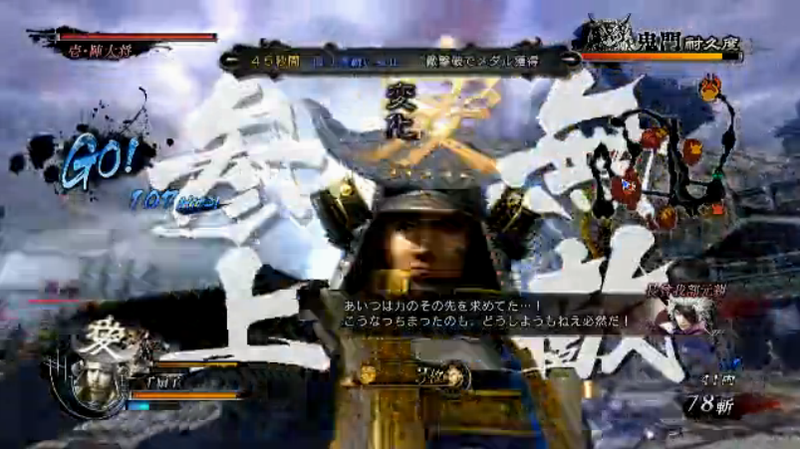 We also got a glimpse of Katsuie's medal costume and a second medal outfit for Yukimura with Oyakata-sama's helmet. A new dinosaur-style costume for Matabee, a close-up of a different hairstyle for Naotora and an Amago Haruhisa-themed outfit for Shikanosuke. Shots of the four skill revisions for the series' leads. The six major collaborations were confirmed next. 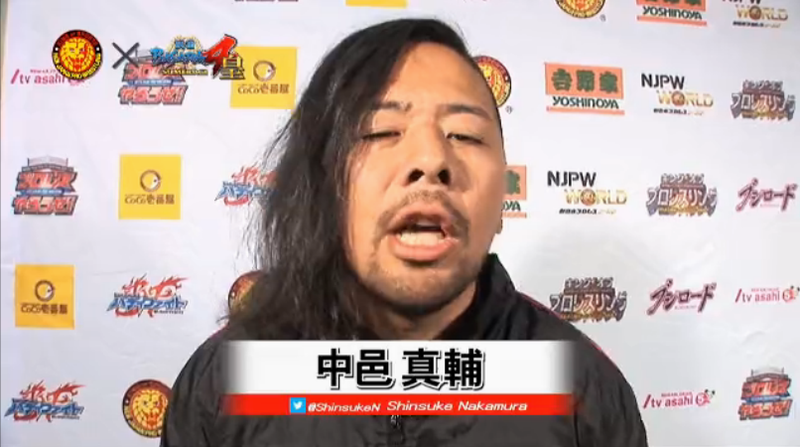 They played special messages from Okada and Nakamura, two of the four NJPW wrestlers whose costumes will feature in the game. They also previewed the preorder DLC and KobaP warned everyone that there are no plans to make it available later so it's important not to miss out. 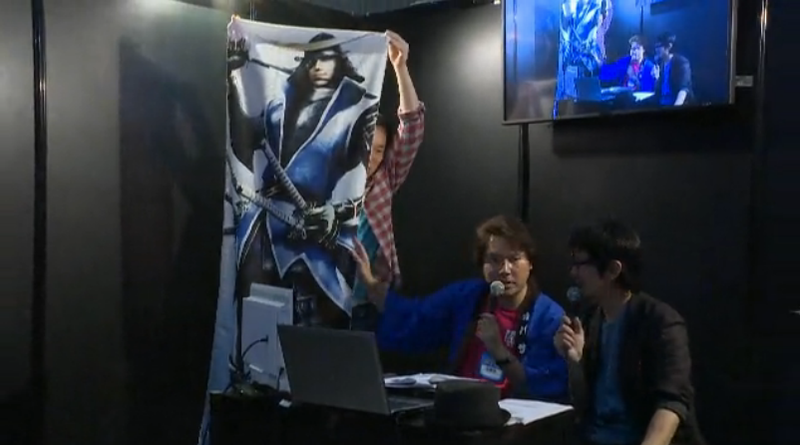 Then came a sample of the e-Capcom exclusive Masamune towel to demonstrate how big it was compared to YamamotoD. It's pretty big. Next came the first actual announcement. 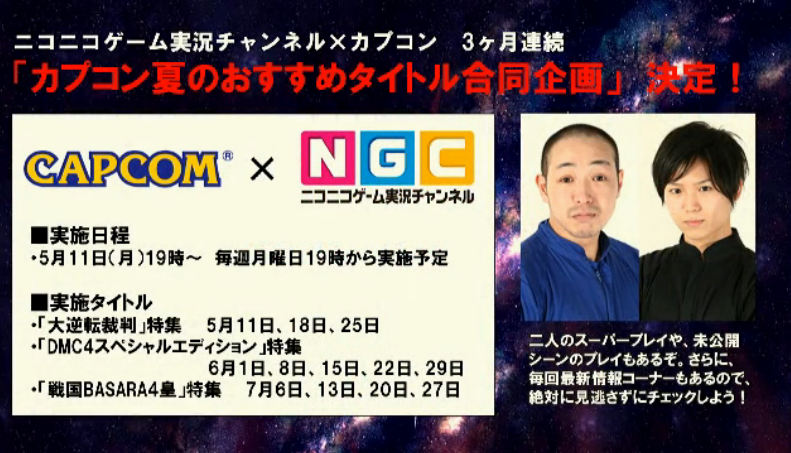 Capcom is teaming up with the NGC Nico Nico Game Jikkyou Channel to broadcast gameplay from its three upcoming summer titles. 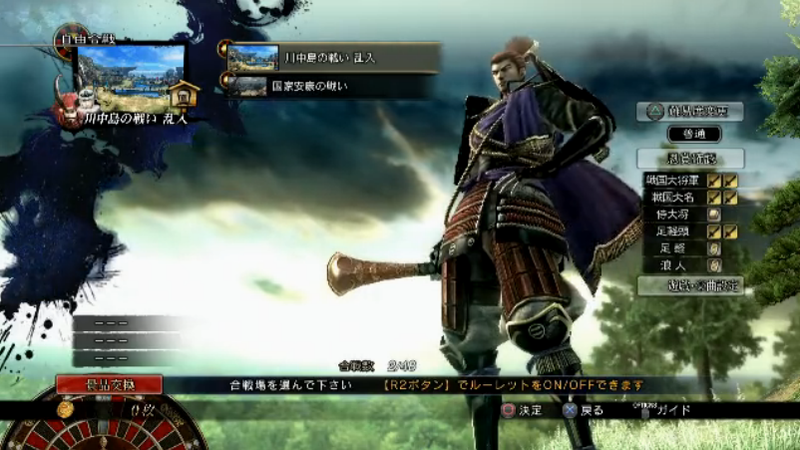 The Sengoku Basara 4 Sumeragi broadcasts will take place at 19:00 Japan time on the 6th, 13th, 20th and 27th of July. They should be worth checking out. Eventually it was time for the debut of the event video they've been teasing all month! 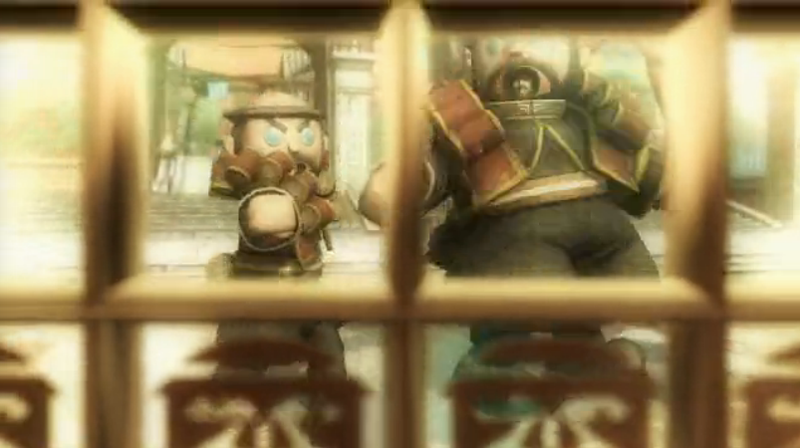 I saw scenes with Motonari and Gyoubu, Ieyasu and Hideyoshi punching one another, the three ninja interacting and Kingo gambling with Sakon (?!). There were also some cool stylised scenes which looked as though they were from an opening sequence rather than the game's story modes. The new ending song is beautiful. I thought it was slightly too 'folksy' at first but Ishikawa's voice swept me away as the video continued. The hosts got back to the announcements once the PV was over. 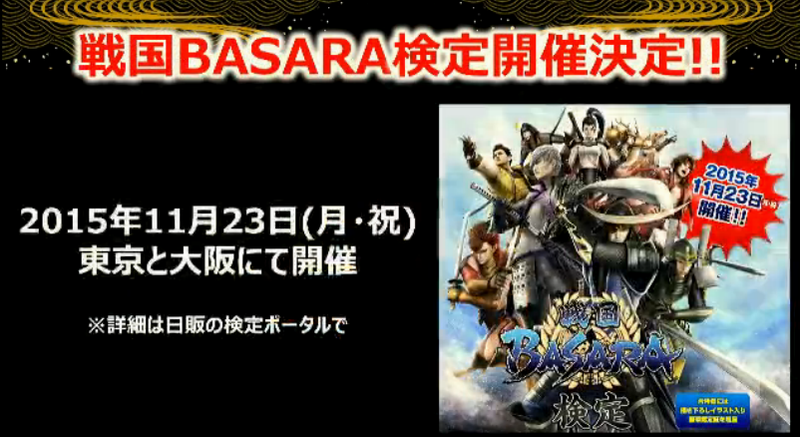 There's going to be some kind of official Sengoku Basara examination in Tokyo and Osaka on 23rd November 2015. 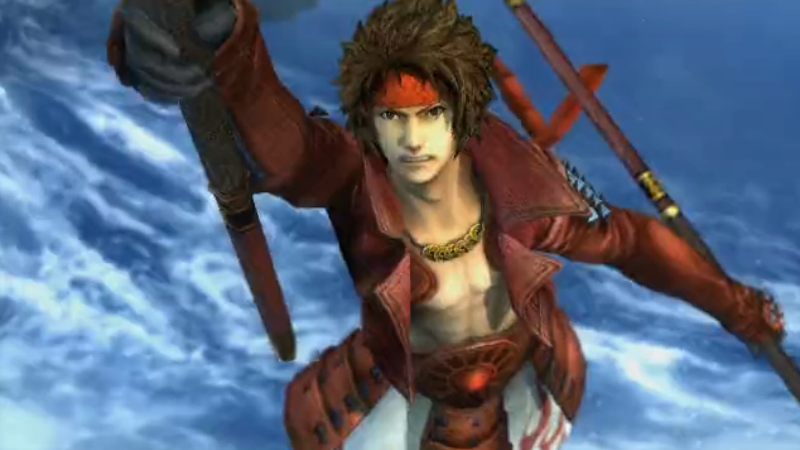 You'll be able to earn a Sengoku Basara qualification! There are also apparently plans to make the test questions available (presumably in a book). There's another new region tie-in to go with the major Kofu City and Saitama Prefectural Museum of History and Folklore promotions that were announced over the last few months: Zunda-flavoured Country Ma'am biscuits. They'll be limited to the Touhoku region. Country Ma'am is a well-known brand so this announcement caused a lot of laughs during the stream. 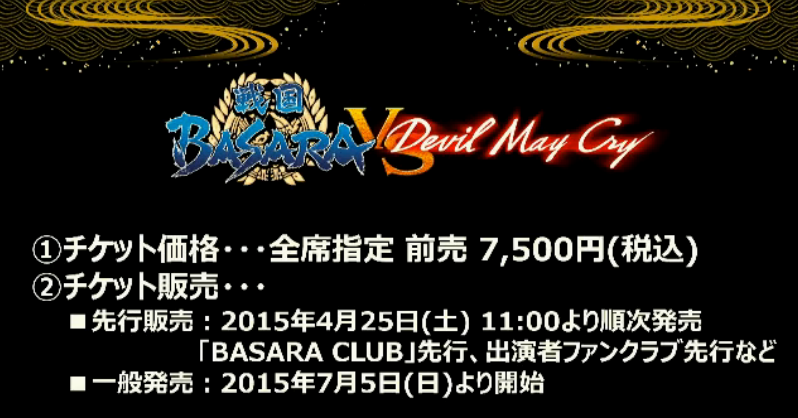 Then came the big new project announcement: a Sengoku Basara VS Devil May Cry stage play. The official website is already online. 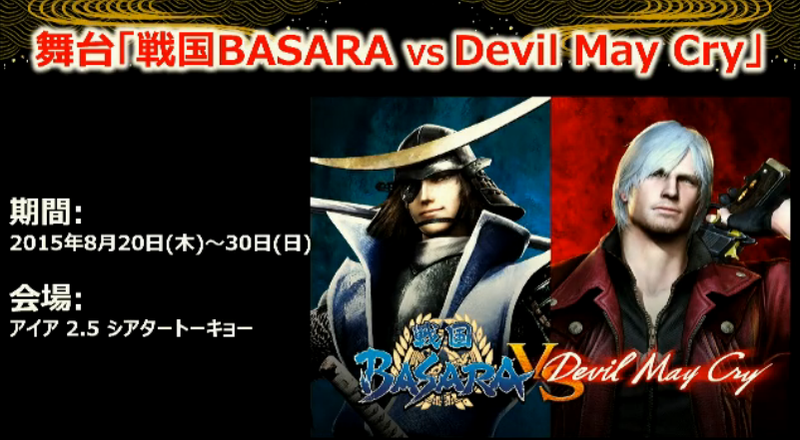 Butai Sengoku Basara vs Devil May Cry will run between 20th August 2015 and 30th August 2015 at the AiiA 2.5 Theatre, Tokyo. There will be 18 performances in total. All advance tickets will cost ¥7,500. Members of the official Basara Club fan club can apply for tickets from 11:00 on 25th April 2015 while everyone else has to wait until 5th July. 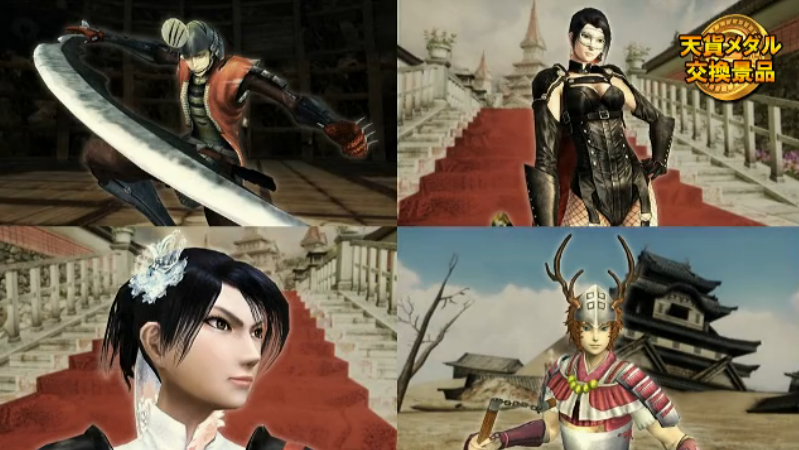 In pursuit of a demon which emerged in some mysterious ruins, Dante, Lady, Trish and Vergil from Devil May Cry end up in the tumultous Sengoku era. 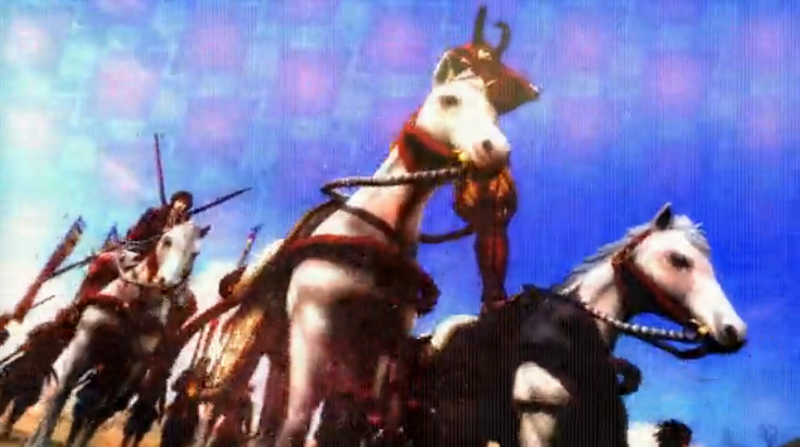 There they meet the warriors of Sengoku Basara, such as Date Masamune and Sanada Yukimura. What kind of tale awaits them in the land of Hinomoto? Yoshida played Kojuurou in the Butai Sengoku Basara stage play series so his presence will excite a lot of fans. 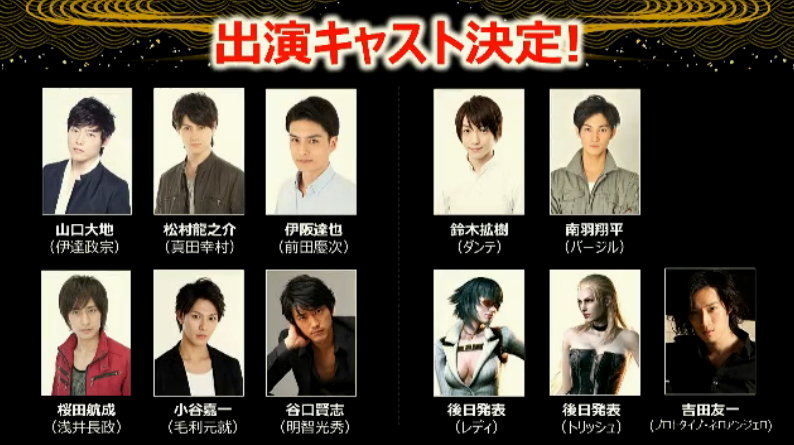 All of the Sengoku Basara cast members are Butai Sengoku Basara regulars. The next panel I watched was the premiere of the new Sengoku Basara 4 Sumeragi characters' gameplay with live commentary at noon. First, Gatchman took control of Yoshiteru and YamamotoD talked him through everything that happened. Yoshiteru certainly does look powerful and his roulette effect is less cumbersome than I thought. 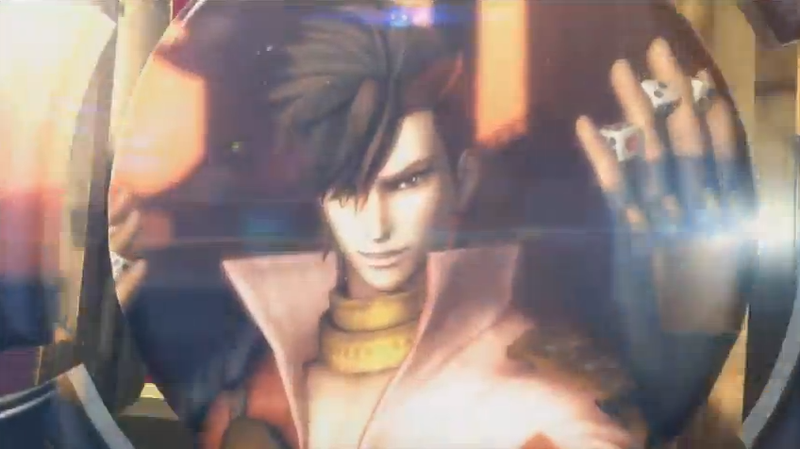 His Basara animation looks beastly in action. 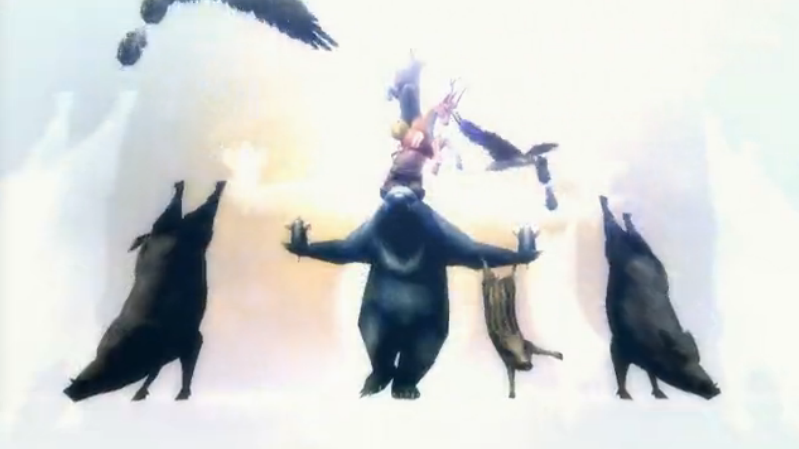 The pause menu showed that they were demonstrating the characters at level 51 and another shot showed it was Normal difficulty. 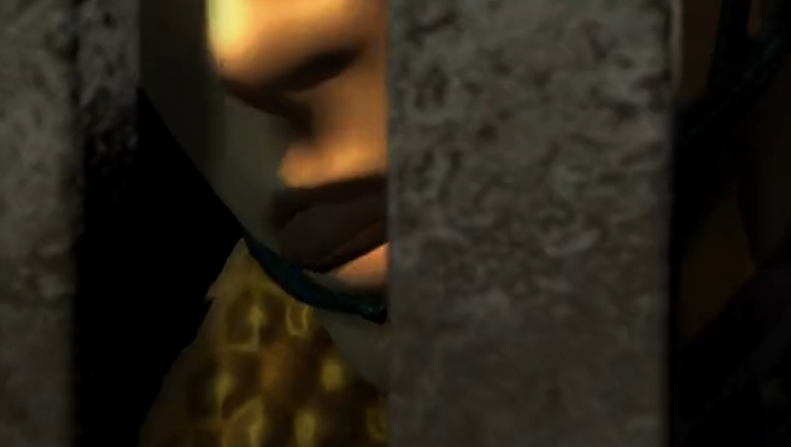 The demo stage was the new Battle of Kawanakajima: Intrusion. By the way, the stage select screen has a total of 48 stages listed (although only 2 were shown). When Gatchman messed up with one of Yoshiteru's roulette moves, part of the screen was covered up to make things harder. 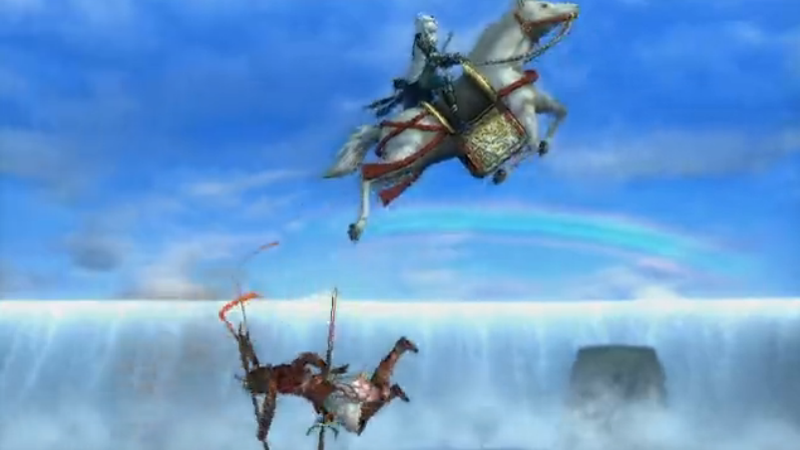 The best part of the stage was Yukimura launching himself from the sky on Shingen's command but there were a lot of interesting cutscenes. They stopped the demonstration before Gatchman advanced too far into the stage to keep some content secret. 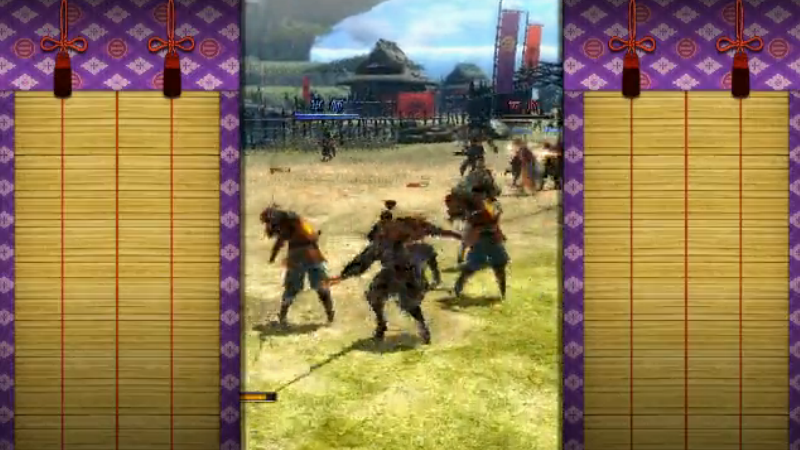 The next demonstration had Gatchman selecting Sen No Rikyuu on the new Battle of Kokka-Anko (National Peace) stage, a clash between Hideyoshi and Ieyasu. 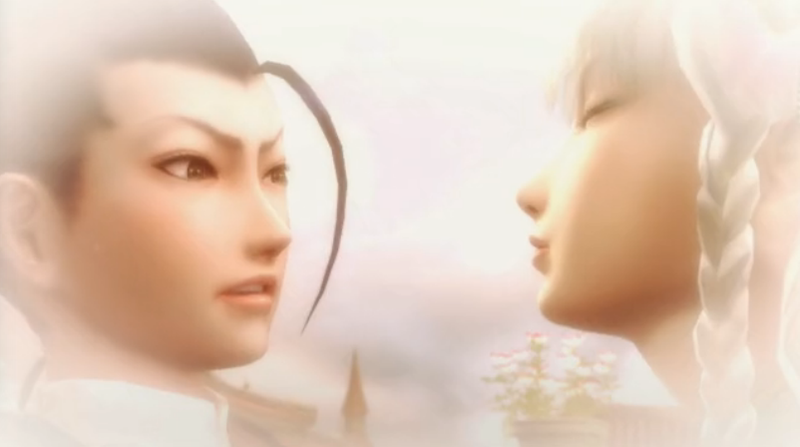 Naturally, Mitsunari is there too and Aniki apparently shows up to assist his friend, so it looks as though there'll be a lot of drama involving this battlefield. It's the one with the 'Demon Gate' shown in the screenshot from yesterday. Rikyuu's Ooyose ('Great Gathering') move is his R1. It's fun to see him roughly tossing the enemies around. He switches between his Sabisuke and Wabisuke personalities extremely quickly. 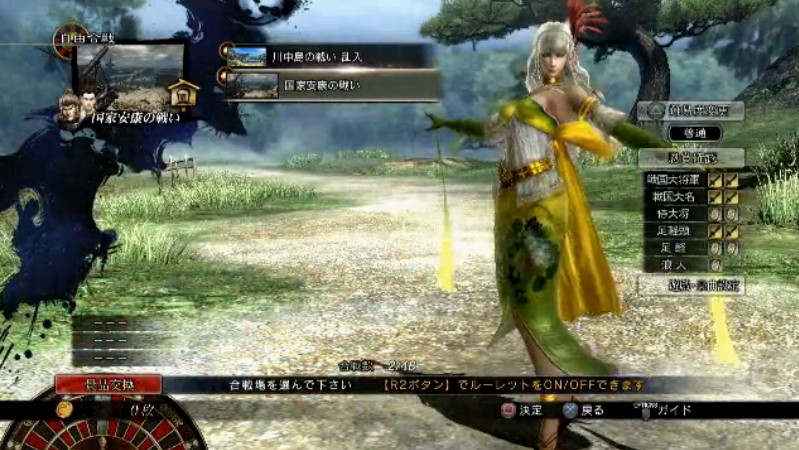 The third character demonstrated was Maria and she skipped and pranced through the stage. She floats in the air when she jumps, like a dancer. 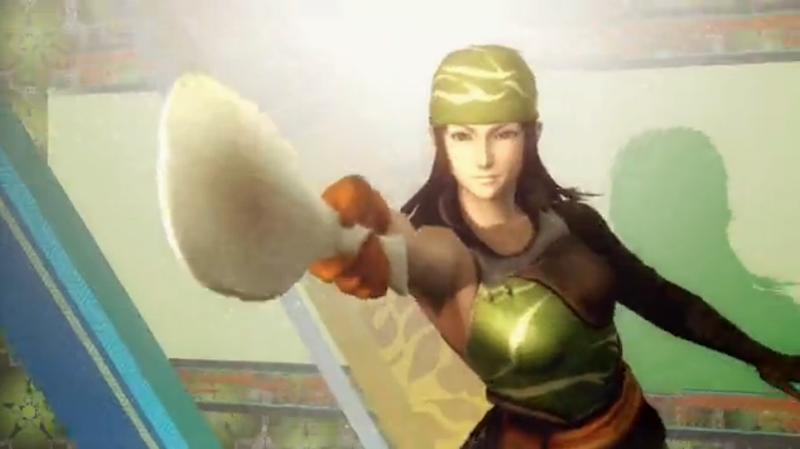 Her moves look extremely fun, using her cloth to bind the enemy soldiers and spin them around like crazy spinning tops. 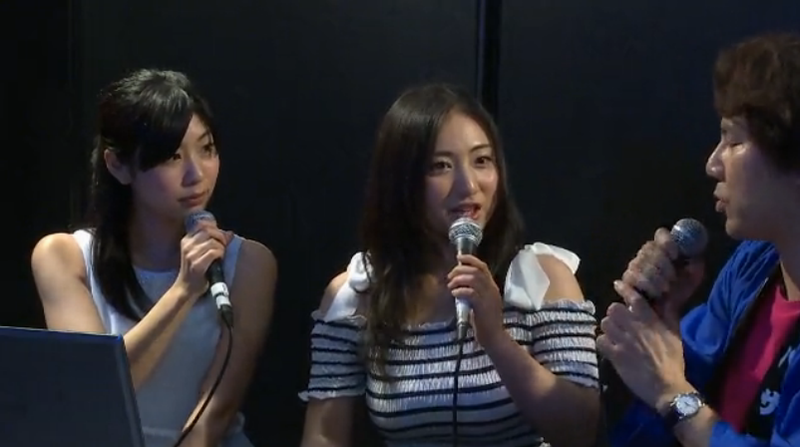 The video stream quality was poor but I think her first R2 special is called Warawa No Toriko♪ ('My Prisoner♪'). 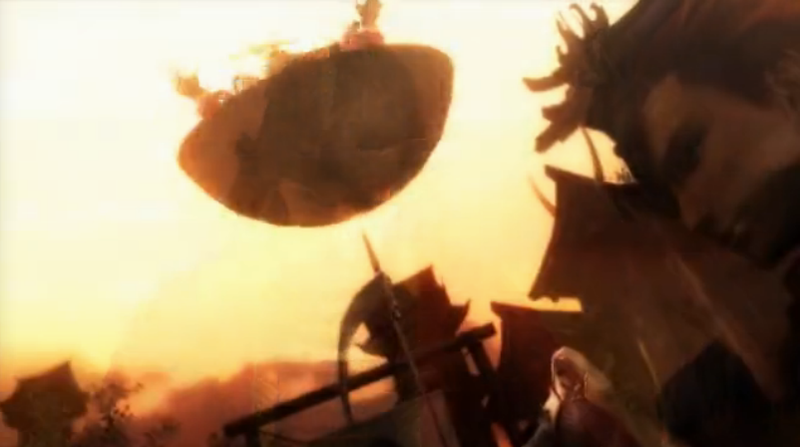 For her Basara attack, she rises up into the air suspended by cloth and the enemies fly around as though they're being used in a game of pinball. The next of her R2 specials is Oshibeshimobe-guruma♪ (Stamen Servant Car♪) where she uses the enemy soldiers like a sledge. Ichiya No Himegoto♪ ('One Night Secret♪') has Maria binding and controlling the camera with her cloth. Her R1 move has her using the cloth like a skipping rope. We also got to see the Battle Roulette mechanic in action. Gatchman was laughing a lot as YamamotoD tried to explain that Battle Roulette was different to Yoshiteru's roulette. Which is also different to the roulette wheel he summons for his elemental R2 attack. Gatchman was delighted when he got a transformation in the Battle Roulette and turned into Kanetsugu, even though he got hit and transformed back almost immediately. He was playing quite casually but I noticed that Gatchman managed to earn hundreds of Tenka Medals without any problems. It looks as though those medal rewards will be easy to pick up. We saw what happened when you fail at the Battle Roulette too. On one occasion, the Xavists intervened to stun the player with an attack from the heavens. You have to shake the stick furiously to resist joining the cult. Incidentally, the shots of the setup screens showed that pressing the R2 button on the stage select screen toggles Battle Roulette on and off. Finally, YamamotoD brought Rikyuu out again to highlight him in more detail. 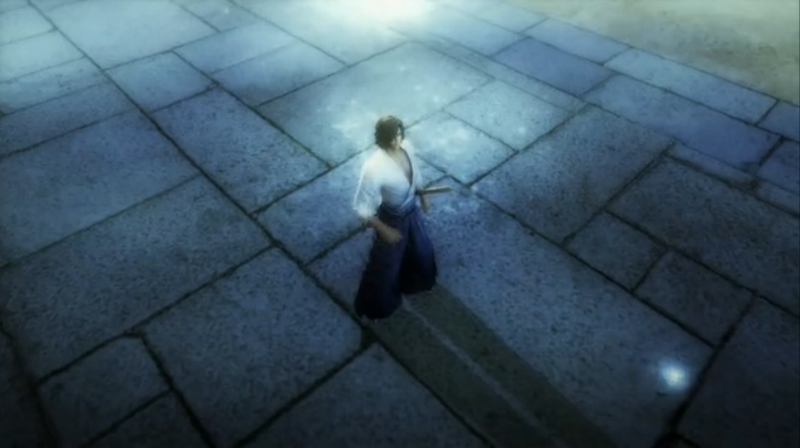 He first appears on the stage as Sabisuke so YamamotoD drew attention to his taunt. 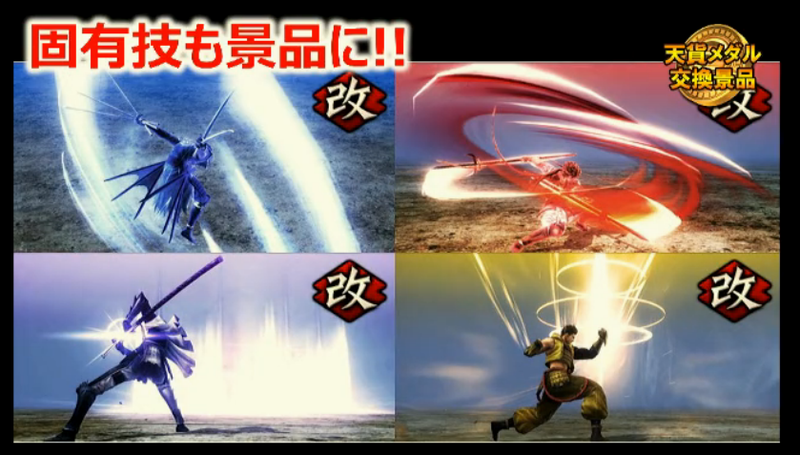 Wabisuke appears for brief moment during the taunt and you can see the struggle for control in some of his animations. It's evidently possible to switch between the two personalities out of combat. 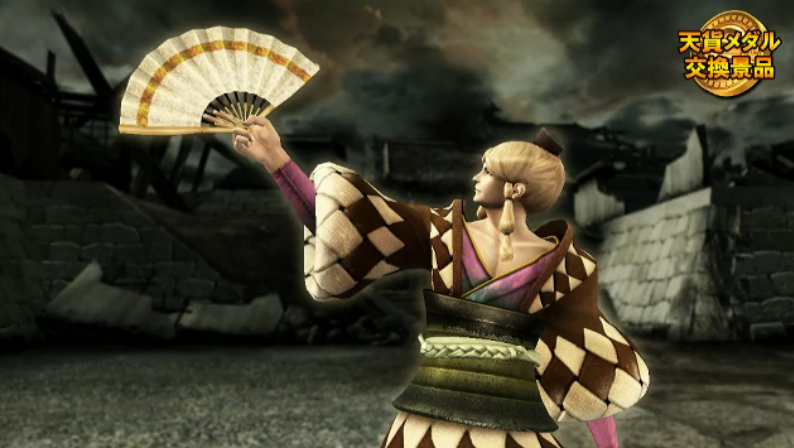 YamamotoD closed the presentation by chatting about how he developed the characters and the already-documented graphical differences between the PlayStation 3 and PlayStation 4 versions of the game. I'm glad I stayed up to watch this demonstration. Rikyuu looks insanely fun to play, even more so than Yoshiteru and Maria (and that's high praise). The next event on the agenda was KobaP's Super Talk Room where he introduced the game to a pair of beautiful female entertainers, Saaya and Raychell. Saaya was extremely energetic and bubbly and it was funny seeing two relatively 'normal' people reacting to all of KobaP's explanations about how ridiculous the new game was going to be. Both women seemed excited about the game and had a lot of feedback each time they were shown something new. Unfortunately the discussion probably wouldn't be very interesting for those who don't speak Japanese and there wasn't any new information revealed. After talking about Sengoku Basara 4 Sumeragi for a long time KobaP switched the topic to Devil May Cry. Eventually Raychell left and Kuraoka Kinatsu replaced her to continue the discussion. The conversation lingered on the characters' physiques when they went through all of the DLC costumes one by one. After the chat session came the Challenge Gatchman! 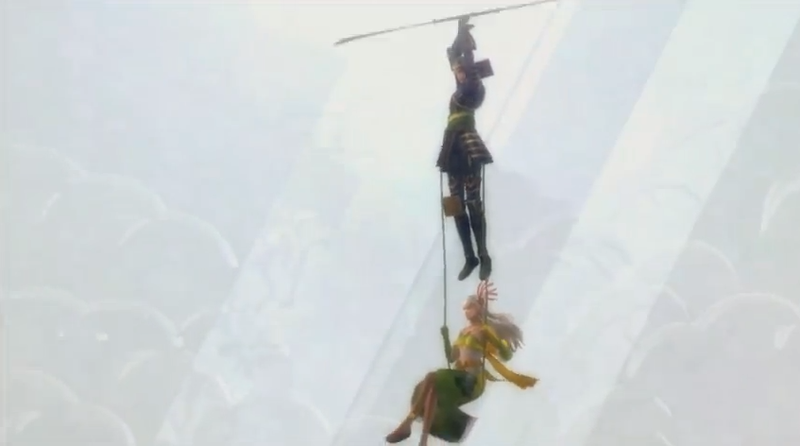 Sengoku Basara 4 Sumeragi 'Super★Bomb Soldier Challenge'. Fans were invited to try a special build of the game where you played a bomb soldier right from the start of the stage. The objective was to collect as many Tenka Medals as possible within five minutes and beat Gatchman's score. If they were successful, they could win various prizes including Sengoku Basara mugs, glasses cases, oversized fans, figures, keyrings and coasters. None of the prizes were event-exclusive. The first challenger was a Rozen Maiden cosplayer who said she was already a fan of the series. YamamotoD provided helpful commentary about the stage (which was the Battle of National Peace Hideyoshi/Ieyasu intrusion mentioned above). 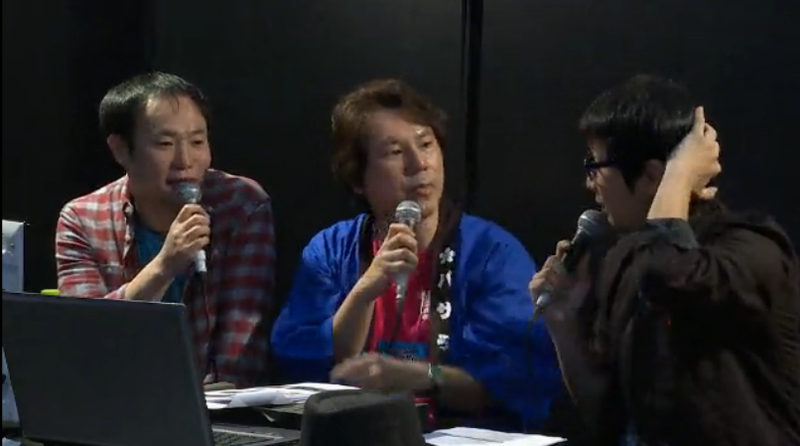 He confirmed that it was the stage from the beginning of Sengoku Basara 3. 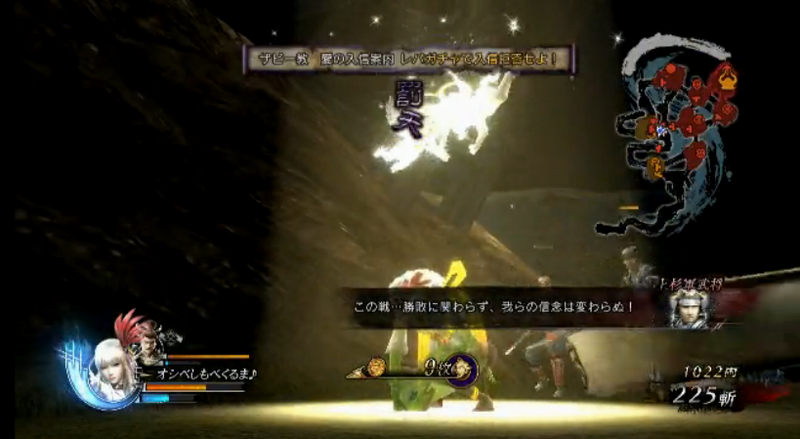 Motochika's Akatsukimaru also definitely shows up as an enemy during the battle. The second challenge revealed another outcome of failing Battle Roulette: a traditional rain of bombs from the sky. They managed to get it three times in a row during the play session. They chose a young man as the third challenger since the first two had been female. He cryptically gave his name as 'Man'. 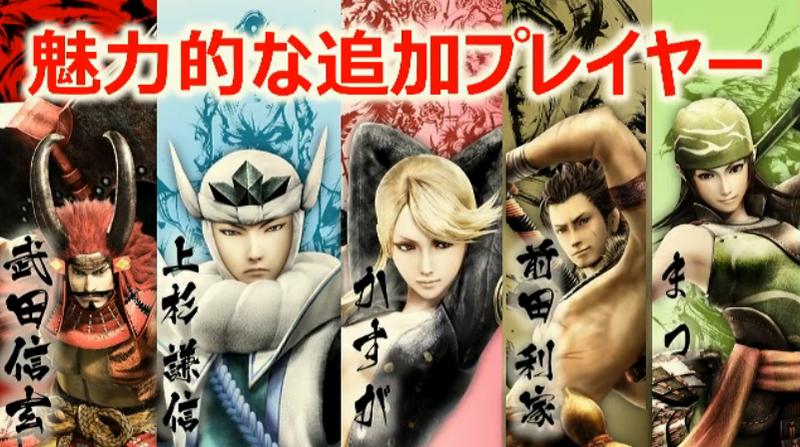 A press release appeared after the stream with more details about the new Sengoku Basara qualification you can pay to try to achieve. The questions will cover topics such as famous scenes, lines and character profiles from the series, among other things. Those who pass the exam will receive a certificate with a special illustration, and participants will also be able to purchase exclusive goods. 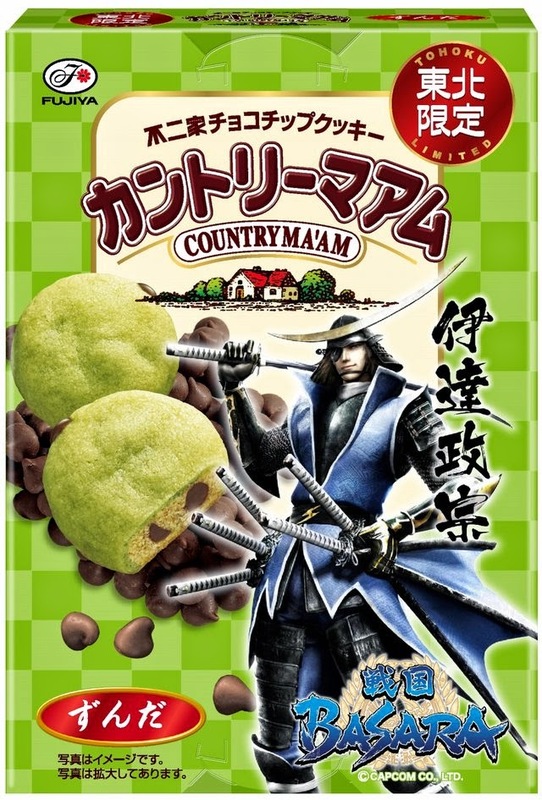 A full picture of the new Country Ma'am packaging was also released. They look tasty. If you missed the stream and want to see the PV and gameplay snippets, you can skip through the Capcom TV YouTube recording to find it. 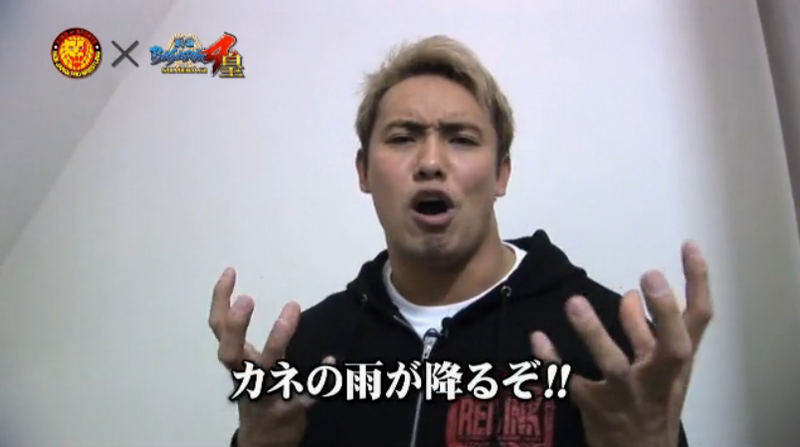 Someone's also uploaded it to Nico Nico Douga in an unofficial capacity. The schedule for Sunday is very similar so it should give us a second chance to check out that new PV. I've managed to join the stream at final moments of youtube translation just in time enough to get a glimpse of Yoshiteru's and Rikyuu's gameplay. And while the shogun is a mix of elegance and brutality combined (Hideyoshi x Hisahide as I'd describe it, minus the grabs) the latter turned out being surprisingly interesting. It's amazing how they're able to deliver character's uniqueness not only by his/her fighting style and VA but also the way of movement. Not to mention his moveset is also cool. The force is strong with this one, lol. Can't wait for a new trailer to appear online in good quality. Yes, there's something about Rikyuu's animations (especially Sabisuke's) which I find captivating. I hope we'll get decent (and high quality) gameplay trailers to pick apart soon; perhaps they're planned for the in-store events next month? If so it might just be a couple of weeks before the first ones show up. If you get a chance to see the Nico Nico stream too (amazed nobody has posted a recording) then it's worth watching that too as the gameplay quality is better and Maria got to appear.